Thousands of articles about action figures, give or take. Presented by Galactic Hunter. No longer daily - updated if we feel like it. Sponsored by Entertainment Earth. Commentary: This Battle Droid mold debuted in Target's exclusive Arena packs with giant saucer eyes which were just plain baffling. The mold, though, was fantastic. It allowed the figure to be sturdier than usual, it could squeeze down nicely, but there was no getting passed the deco. The giant eyes were on many of the 2010-2011 rereleases, which had two of this droid (including an officer) on a single Saga Legends package for less than $9. It was a spectacular deal, as this figure is significantly better than the 2012 carded Battle Droid from Movie Heroes. With 12-ish points of articulation (as not everyone counts the same way) the figure is excellent. It's a little chunky, but that's OK - it stands up pretty well and was one of the first times we saw ankles on a droid. Well, it was when it debuted. By its re-re-release in 2012 it was pretty normal, and we spoiled fans probably took for granted that the red deco with the correctly-sized eyes was a fairly decent improvement over previous releases. (The commander antenna was left out.) He has no problems carrying his blaster and the telescoping neck is a nice touch. The deco isn't overwhelming, and it looks less anemic than some of the recent tan droids. 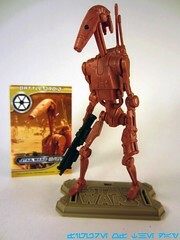 I'm still not sure why Hasbro insisted on doing an all-new Vintage Battle Droid in 2012 when this version was still quite good and, frankly, underserved in the toy market. I'd have bought this mold in a few more colorways, given the chance. Ah well. Collector's Notes: I'd say if the price is right, say $13 or so, this gift set is worth snagging. It was not particularly popular, as the other figures were not as impressive as the Battle Droid. It's still quite nice. There's some debate if this mold wasn't too tall, and likewise if the Vintage version isn't too small. The Figure of the Day blog archives material written by Adam Pawlus at Galactic Hunter.com for ease-of-searching. Figures presented in this column were purchased privately by the author or are provided courtesy Hasbro, Hunter PR, Entertainment Earth, or elsewhere. Items are part of the staff archives and are not for sale.